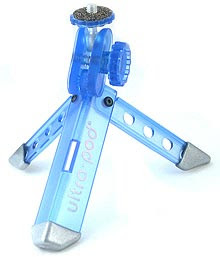 The UltraPod is a minimalistic ultralight tripod for digital cameras and other devices with a tripod mount like some flashlights. It has three foldable translucent polycarbonate legs with a metal cap in the end, the legs can't be adjusted in length. The head has a ball-joint adjustable camera attachment, that is used to point the camera in the right direction and angle. The Ultrapod comes with a velcro strap that can be used to attach the tripod to a tree limb, a chair, a pole, a rock etc. The idea is that you fold the legs, attach the folded legs and then attach the folded legs to the anchor point using the velcro strap. This is a tripod that works very well with the small digital cameras but is probably not a good idea with big SLR or SLR-like cameras, if you have one of the small and light cameras having one of these in your kit can always be a good idea for those long exposure night shots or to take a group picture without leaving someone behind. The total size when folded is 5'' and it's extremely light, it can be carried in any bag or backpack without risk of damage since the construction is solid. You can order from Thinkgeek for $12. For those that frequently camp or like to do adventure hikes water is a top priority and since you can't carry unlimited amounts of water a water purification device is an useful tool. The SteriPen uses UV light to purify water, it destroys bacteria, viruses and protozoa making the water safe to drink without leaving any chemical residue or odor in the water. Using the device is simple, just press the button and agitate the water with a gentle stir. 16 oz of water can be purified in less than a minute and it takes a minute and a half to purify 32 oz of water. The device works using four AA batteries, with alkaline batteries you can purify 20 to 40 16 oz glasses of water, using lithium AA batteries this can go up to 100 glasses so lithiums are strongly recomended. The total weight of the steri pen with batteries is 8oz (6.4 with lithiums), it comes with a carrying pouch so it's simple an easy to carry. We found it simple to use and effective and safe to carry, no chemicals involved. 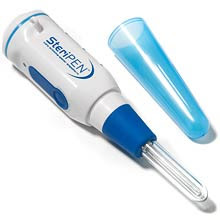 Since it uses UV light to purify the water needs to be clean for the steripen to be effective, if the water is not clean you have to filter the water first so you need to carry some kind of filtering device to make sure you will be able to use the steripen. There is a kit that comes with a solar charger for long trips and camping and the company also sells a filtering device. You can read about the different models and products from the company website. The version tested here can be ordered from REI for $100.